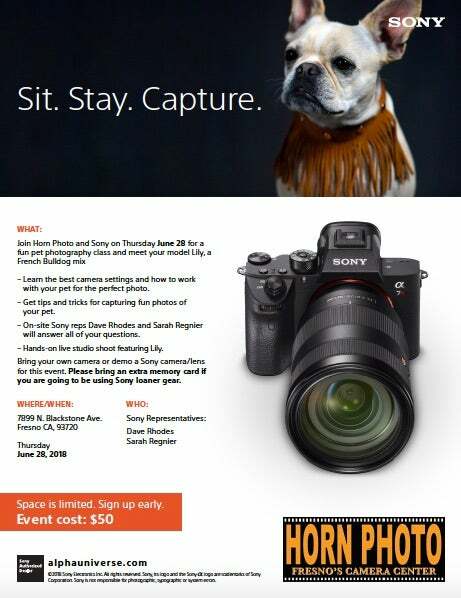 Join Horn Photo and Sony on Thursday, June 28 for a fun pet photography class and meet your model Lily, a French Bulldog mix. Learn the best camera settings and how to work with your pet for the perfect photo. Get tips and tricks for capturing fun photos of your pet. On-site Sony reps Dave Rhodes and Sarah Regnier will answer all of your questions. Hands-on live studio shoot featuring Lily. Bring your own camera or demo a Sony camera/lens for this event. Please bring an extra memory card if you are going to be using Sony loaner gear. Cost for the event is $50. Space is limited – sign up early!